Several people were injured as thousands of far-right protesters rallied Monday in the eastern German city of Chemnitz where a knife killing, allegedly committed by a Syrian and an Iraqi, had sparked racist mob attacks that were deplored by Chancellor Angela Merkel. 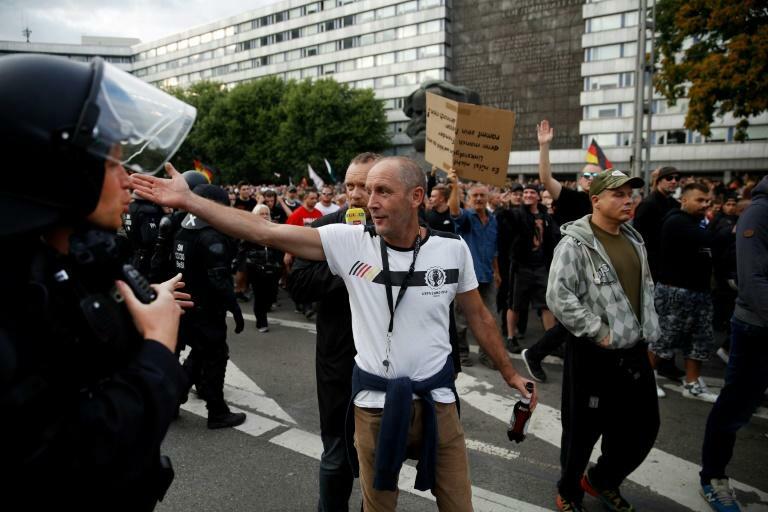 Hundreds of riot police separated the noisy crowd -- whose mostly male members were chanting slogans against "criminal foreigners" and waving black-red-gold German national flags -- from more than 1,000 anti-fascist counter protesters. Pyrotechnics and other objects hurled from both sides left several people injured and requiring hospital treatment, said police, who moved in water canon and urged the crowds to remain calm. The right-wing protesters chanted "We are the People" and the Nazi-era term "Luegenpresse" (lying press) and displayed placards that read "Stop the refugee flood" and "Defend Europe", the latter adorned with an image of an automatic rifle. Some carried banners or insignia of the far-right AfD and neo-Nazi NPD parties and other extremist groups, while a handful delivered the illegal right-handed Hitler salute, said police. Their opponents, separated by a police line, yelled "Nazis, get out" and held up banners that read "Rule of Law, not Vigilante Justice". The mood was highly charged a day after the knife attack early Sunday left a 35-year-old man German man dead and sparked street chaos in which marauding right-wing hooligans assaulted people they believed to be immigrants. The anti-Islam PEGIDA movement's regional chapter, urging people online to come to Monday's rally, told them to "muster strength from anger and sadness! Only together can we ensure that his death was not pointless." A strong police presence Monday evening would "prevent aggressors from taking over the streets" again, vowed Saxony state interior minister Roland Woeller after what he labelled "a new dimension in the escalation" of simmering local tensions. The ugly and violent scenes Sunday of some 800 far-right hooligans and other mostly male and white protesters taking to the streets, chasing and attacking foreigners have sparked widespread revulsion. Footage on social media, republished by mainstream media groups, showed angry protesters shouting "you're not welcome here" at those they believed to be foreigners. Police said extremists on Sunday attacked an 18-year-old Afghan and his German female companion, 15, punched a Syrian man, 18, and grabbed and threatened a 30-year-old Bulgarian man. Merkel's spokesman Steffen Seibert said that "riotous assemblies, the hunting down of people who appear to be from different backgrounds or the attempt to spread hate in the streets have no place in our country". Saxony state premier Michael Kretschmer called the scenes "disgusting", while the Turkish community in Germany labelled the street violence "an attempted pogrom". A lawmaker of the far-right Alternative for Germany (AfD) party appeared however to endorse the vigilantism, writing on Twitter that "If the state can no longer protect the citizen, then people will go on the streets and protect themselves." Saxony state in the ex-communist east has become a hotspot for racist hate crimes as resentment runs deep in the region against the arrival of more than a million asylum seekers in Germany since 2015. In central Chemnitz, flowers and a candle marked the spot of the knife killing where a blood stain remained on the ground. Police said Monday they had arrested a Syrian man, 23, and an Iraqi man, 22, on suspicion they had killed the German man, 35, with multiple stab wounds in an altercation in the early hours of Sunday. Two others, men aged 33 and 38, were hospitalised with severe injuries after the fight on the sidelines of a street festival, police said. "The investigation, especially into the motive, the details of the crime and the murder weapon, is ongoing," police said. Woeller urged calm in the city and asked that its people not believe "online misinformation, rumours, speculation and outright lies".